An important new analysis from Christian Aid. Note the pull-out quote highlighting the problems with the OECD’s Common Reporting Standard, or CRS. New, detailed examination of the SwissLeaks files by Christian Aid working with the US-based Financial Transparency Coalition (FTC) graphically reveals the harm tax haven secrecy does to the economies of developing countries. The SwissLeaks scandal involves thousands of secret accounts at HSBC’s Swiss subsidiary HSBC Private Bank (Suisse), and the billions of euros held in them over a five-month period in 2006/2007. Media speculation sparked by the International Consortium of Investigative Journalists which examined the accounts after details were leaked by a former bank staff member centred on the huge amounts involved, and the potential crimes of tax evasion and money laundering. 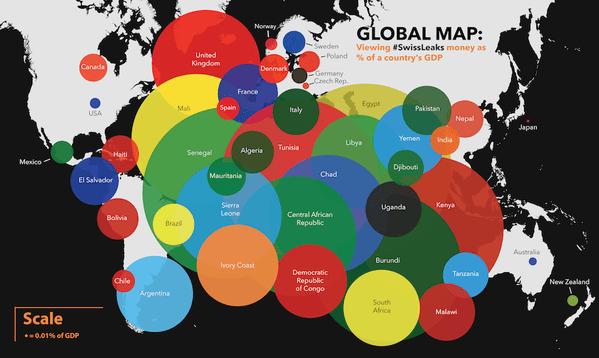 While the largest sums deposited came from rich countries such as the UK( $21bn) the US ($13.4bn) and France ($12.5bn) research by Christian Aid and FTC published today in a report SwissLeaks Reviewed reveals that proportionally, the countries that lost out most were in the developing world. The findings were obtained by comparing the amount held by account holders in individual countries with the size of each country’s GDP*. While the percentage of GDP amounted to 0.81% for the UK, 0.08% for the US and 0.45% for France, it was a different story in the developing world. The $272m held by accounts linked to Zimbabwe amounted to 2.02% of that country’s GDP, $188m from Senegal amounted to 1.28% of GDP, the $.5bn held from Tunisia amounted to 1.18% of GDP, while the $33m from Sierra Leone was 0.8% of GDP. “Because the totals involved from developing countries weren’t huge, no real attention was paid to them, yet proportionally Zimbabwe had more than four times as much in HSBC Switzerland as France, and Senegal had nearly three times as much,” said Joseph Stead, Senior Economic Advisor at Christian Aid. “In comparison with the US the difference is even more striking – proportionally, Zimbabwe’s deposits were 25 times greater than those from US, and Senegal’s were 16 times greater. “Such analysis shows that while the undetected movement of money and assets to offshore banks is a problem for many governments, countries that already have little to begin with stand to lose much more. Mr Stead added that while it is difficult to quantify just how much increased government revenue a particular country could realise based on their citizens’ money stashed abroad some countries have revealed how much in taxes and fees they’ve already started to recoup from the HSBC Swiss accounts. “Spain says that it has recovered roughly $340 million from its citizens’ HSBC Swiss accounts, roughly 15% of the total amount linked to the country. 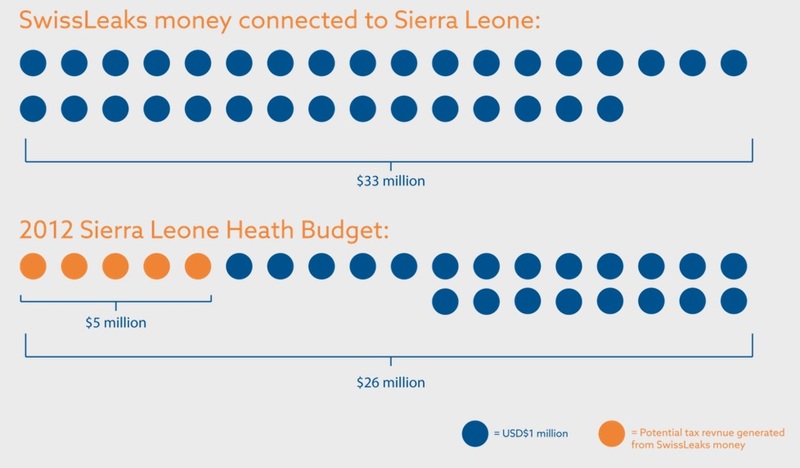 “If we apply Spain’s rate of return to Sierra Leone, for example, the potential revenue is $4.95 million. Though $5 million may sound paltry at the onset, the fact that the potential tax revenue from just one bank in just one secrecy jurisdiction could equate to roughly 19% of the country’s 2012 health budget is shocking,” said Mr Stead. He added that the findings highlighted the weakness of a new cross border financial information exchange system that has been drawn up by the G20 and Organisation for Economic Co-Operation and Development to combat tax secrecy. Called the Common Reporting Standard, it involves participating countries trading financial information with each other at designated intervals. Many low-income countries, however, will not be able to participate when the system is launched because of a ‘reciprocity’ rule that says a country must share information to receive it. “In theory, this mutual exchange is logical, but a number of developing countries simply don’t have the capacity or technical systems to comply with their side of the requirement from the start,” said Mr Stead. “They were barely consulted when rich countries drew up the arrangements in the first place. With the standard about to come into force, developing countries that can’t meet the requirement should be given a temporary period of non-reciprocity where they can receive information without having to send their own. This will give governments the time necessary to build capacity to share their own information. “There really shouldn’t be any objection to doing this, as there is barely any offshore money held in developing countries banks. The lowest income countries have less than half of one percent of the offshore market.